Have you backed up your computer files lately? Horror stories abound. A student loses the term paper she'd been working on for six weeks when her computer crashes; a family loses priceless photos when a laptop is stolen. These are two scenarios cited by David Friend, CEO and founder of Carbonite, a Boston-based company offering on-line backup for consumers. According to a recent Carnegie-Mellon University report, hard drive failures affect up to 13 percent of all personal computer users each year. And yet surveys show almost half of users do not back up their data. Even computer-savvy techies such as Jeff Giacomelli, an IT support administrator at Sepracor Inc., a Marlborough drug development company, regularly helps employees who have hard drive failure but still doesn't back up his home computer. "I'm like the carpenter who lives in the worst house," said Giacomelli. "I keep saying I'm going to burn files to a CD or buy a hard drive, but I haven't yet," he said. Giacomelli is a typical computer user, but with the variety and choices of USB-plug-in hard drives on the market today, there's no excuse to live at the mercy of a volatile computer. "Every hard drive will eventually fail - it's just a matter of time," Giacomelli said. "They are electromechanical, so at some point, they will stop working, depending on usage." Hard drives have gotten smaller, lighter, faster, and easier to set up, said David A. Kelly, president and founder of Upside Research Inc., a Newton-based technology research company. "They've also increased dramatically in capacity," he said. "A few years ago, a 160 gigabyte hard drive was considered large. Now it's easy to pick up a 500 gigabyte or even 750 gigabyte drive at your local office or electronics store." The bulky, heavy, and multi-cord hard drives of the past have even evolved into devices that are suitable for a mobile workforce. For the all-thumbs, nontechnical computer user, the basic step to using external hard drives is simple - plug the drive into your USB computer port on your PC or Mac and create folders or save files. Many come with additional software for backup, privacy, or drive management that you can install or set up, said Kelly. Using a USB memory stick is another inexpensive option. These are lightweight, portable data storage formats that can hold more than a CD (700 MB). For small business owners in particular, Richard D. Lee, chief at large of Pillar Consulting Corp., a New York City computer consulting service, said his personal favorite for backing up data are online backup services such as IBackup, Xdrive and Mozy. The backup occurs at a scheduled downtime, and the information is sent in compressed and encrypted form to a remote server. "The only disadvantage is that you pay per Gigabyte of storage and this can add up to be a very big fee," said Lee. Such automated backup software comes with many external drives as well, and "special agent" Paul Kiley of the Boston-area Geek Squad said that automatic incremental backups are always a good idea. "Most people start out with good intentions," he said. Among the top players in the external USB hard drive industry are Seagate, Western Digital, Hitachi, Iomega, and Maxtor, with prices ranging from $80 for 80 GB to $250 and up for 350 or 500 GB. No matter how you back up your files - putting copies on CDs, storing on a memory stick, using an online service, or external USB hard drive - the important thing is that you do it. "I can honestly say that I have had customers actually weeping on my shoulder when confronted with the news that their hard drive was dead and the data either totally gone or recoverable only in a professional clean room/lab environment for thousands of dollars," said Geek Squad's Kiley. 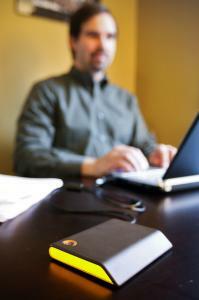 n When shopping for an external hard drive, ask yourself what it will be used for, and how often. The main categories include portable external hard drives, designed for desktop or notebook computers; external hard drives, high-capacity devices used to back up valuable data and streamline data management; and network attached storage, allowing multiple users to share files. n External devices for auxiliary storage are based on connection type, either USB 2.0 (Universal Serial Bus, a standard interface for devices) or Firewire. n Look for quality name brands. n Features to shop for include: USB connection; integrated power supply; and software for back-up and synchronization to help you manage your external drives. Start at a local store with a good return policy. Or shop online at popular stores such as CDW.com, TigerDirect.com, or Dell.com. Be sure the drive has a good warranty. n The latest entry into the hard drive market are drives based on solid state memory instead of mechanical-magnetic hardware, which is more subject to failure. These Solid State Discs (SSD) are more durable, lighter, and smaller, but currently also more expensive. n The "poor man's" method of backing up data such as your resume, a thesis, or scanned passport is to e-mail it to yourself. SOURCES: Upside Research, Geek Squad, Pillar Consulting Corp.